A few days ago I came across a car I'd never heard of before: The DKW Munga. Little did I realize it was the grandfather of those all-conquering Group B Rally Audi Quattros. You read that right. It's a fairly simple history of how a little four-wheeler from a car company nobody remembers anymore ended up becoming the definitive symbol in four-wheel-drive around the world. So let's start at the beginning. DKW stands for "Das Kleine Wunder" (The little wonder). It was the name given to the company's first and monstrously successful two-stroke motorcycles not long after WWI. DKW the company soon became one of the largest motorcycle companies in the world and then they went on to make some of Germany's first great people's cars, starting in the 1920s, long before some guy named Hitler ever announced anything called a "Volks Wagen". DKW was a pioneer in front wheel drive back in the 1930s, which is the same time that they joined in Germany's big new multi-brand car conglomerate, Auto Union. Those four rings on the front of your new A4? They stand for DKW, Horch, Wanderer, and Audi. In any case, in the 1950s, the West German military realized that since the Americans had whupped their asses in dubya dubya two with their four-wheel-drive Jeeps. The West German military issued a design competition for a design (just like the Americans did with the Jeep) and out of the process came the DKW Munga, which stands for Mehrzweck UNiversal Geländewagen mit Allradantrieb or "Multi-purpose universal all-terrain vehicle with four wheel drive." That is quite possibly the best name for a Jeep ever. The Auto Union conglomerate ended up building these things from 1956 on through 1968, even selling them in the US as the DKW Bronco. I'm getting a little sidetracked here, but those Broncos were sold through Mercedes, because Mercedes actually owned Auto Union back in the '50s and '60s. Even more oddly, the cars were sold through Studebaker dealerships, but again I'm getting sidetracked here. How Had I Never Heard Of This Car Before? And I thought I was a DKW fan! In any case, about a decade after the Munga went out of production, VW had bought Auto Union from Mercedes and they redesigned the basic platform into the VW Iltis, again for military duty. In 1980, two years into of its production, some guy named Ferdinand Piech (you may know him as the man behind the Porsche 917, the Bugatti Veyron, and the current VW XL1. I know him as the man who slept with his cousin's wife in an effort to gain control of the Porsche supervisory board) decided to take the VW Iltis to the Paris-Dakar, perhaps the toughest motor race anywhere in the world. The Iltis won. Back in 1977, during the development of the Iltis, one of Audi's engineers realized just how much more capable the underpowered four-wheel-drive Itlis was than any other high-powered two-wheel-drive car, at least in the snow. The engineer convinced Piech to allow a team of engineers to to take the four-wheel-drive technology of the Iltis and Munga and work it into an Audi 80. This was an unbudgeted project, Isham-Research points out. As they say in Pokemon, it was super effective. The German Wikipedia page on Quattro details some of the early prototype tests of the Audi Quattro system from 1978 and 1979. Piech first showed off the prototype to the Volkswagen board at the snow-covered Turracher Höhe in Austria, one of the steepest roads in Europe. The Quattro prototype didn't just climb the hill, it did it on summer tires. The Quattro ended up being able to climb a 28% grade, again in heavy snow. After watching these tests, the VW board approved the system for production. 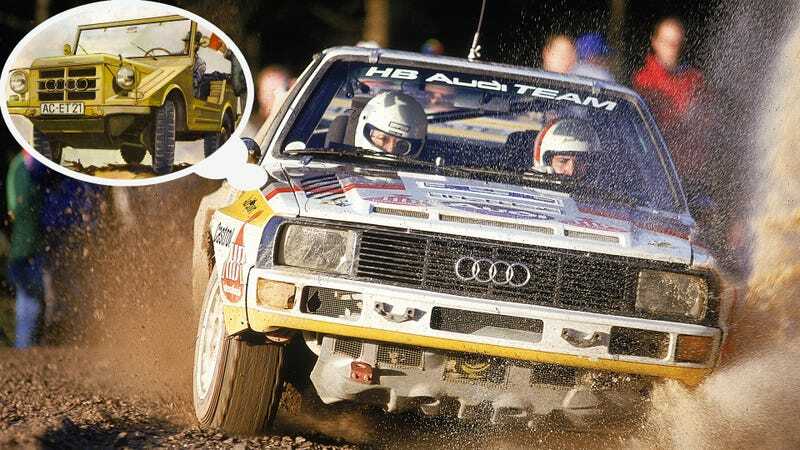 Audi started making Quattros in 1980, the next year they took them rallying. This is curious, since four-wheel-drive cars had been banned from rally competition before the Quattro entered. According to one rumor (here noted on an Australian auction site), Audi had petitioned for four-wheel-drive cars to allowed in back in 1978. The governing body looked at all the cars Audi was making and saw the only 4WD model was the pipsqueak VW Iltis. Seeing no threat, they allowed four-wheel-drive starting in 1979. That is, of course, a rumor, but it goes to show how secret the Quattro's development was, and how unprecedented its performance was, as well. Audi won the world rally championship in 1981 and 1984. The final version was a cut-down, lightweight, bewinged monster with something in the neighborhood of 600 horsepower according to Audi itself. And all the while it was still using technology derived from this wheezy little 1950s DKW. That's quite an evolution.